The neck on an English Toy is moderate in length and nicely arched. The body is short, compact, square and deep on cobby lines with a broad back. The breed should be sturdy of frame with good rib and deep brisket. 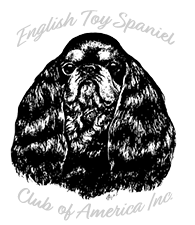 The English Toy tail is docked to 2 to 4 inches in length and carried at or just slightly above the level of the back. The set of the tail is at the back’s level. Many are born with a shorter or screw tail, which is acceptable. The feathering on the tail should be silky and from 3 to 4 inches in length, constituting a marked "flag” of a square shape. The tail and its carriage is an index of the breed’s attitude and character.